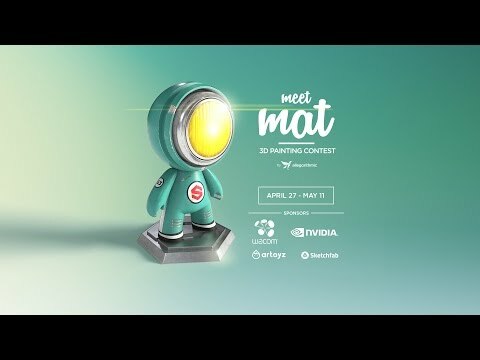 Mesh of MAT, for the "Meet MAT: The 2017 Substance 3D Painting Contest"
By exception to section 1.2 of Substance Share (End User) License Agreement, use of Mesh Mat is not subject to CC BY 4.0. Non-commercial purpose is authorized and subject to other provisions of Substance Share License Agreement. Use of Mesh Mat for any commercial purpose is subject to Allegorithmic prior written consent and conclusion of a specific licensing agreement, as the case may be. in the video, he shows an fbx file, yet this is an obj file. the fbx has 3 texture sets, this obj only has one default material... overlapping uvs make it impossible to bake. The file is an object file not an FBX. Can't bake the maps right. @Giovanni - did you try unclicking the checkbox "create a texture set per UDIM file" ? That will mess it up. @garretthoyos It was already unchecked. I got it to load on substance painter but it's not set by materials so the maps are messed up. A lot of UV space is unused on the body and base meshes. We could paint more detail if the UV map was more efficient. any news on the fbx file? If you are having issues with the mesh, open in max/maya. assign a unique material for each model part, export as FBX. For some reason using the OBJ format does not create texture sets. This should be competition legal because you are not changing the mesh! "3. You may not modify any aspect of the mesh template." which probably means you can not create texture sets or change it to a FBX unless they do it. Just downloaded, it's an FBX and is working correctly. thanks! let the substance showdown begin! i have to use only the materials that tue mesh come with or i can add more? can o use an id map? Can you do more than 1 entry?